Three golden crowns adorning the deities Lord Govinda Raja Swamy and his consorts Bhudevi and Sri Devi were found missing from the Govinda Raja Swamy temple at Tirupati in Andhra Pradesh, police said on Sunday. The Tirupati urban superintendent of police KKN Anmburajan told Hindustan Times that a manhunt has been launched with six teams headed by two sub-divisional police officers. 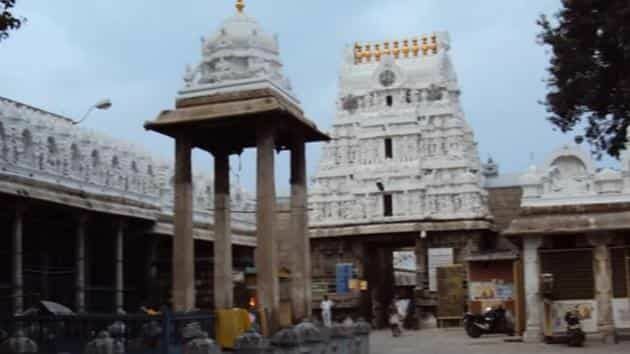 Tirupati Tirumala Devasthanams (TTD) Assistant Executive Officer Kola Bhaskar said the theft was noticed around 10.30pm on Saturday and the TTD’s vigilance wing immediately informed the police. The main doors of the temple were closed after the evening ritual of naivedyam was offered to the deities. When the doors were re-opened half-an-hour later, the crowns were found missing, he said. The crown adorning deity Govinda Raja Swamy weighs 528 grams while those of Sri Devi and Bhu Devi weigh 528 grams and 408 grams respectively. As there were no visitors after naivedyam, the police are suspecting one of the temple staffers to be involved in the theft, Bhaskar said. Three priests perform duties in shifts. The theft was noticed after the first priest finished his duties and was replaced by the next priest, he explained.